I’ve been stocking up on cool summer dresses because they’re the best during the warm summer months. 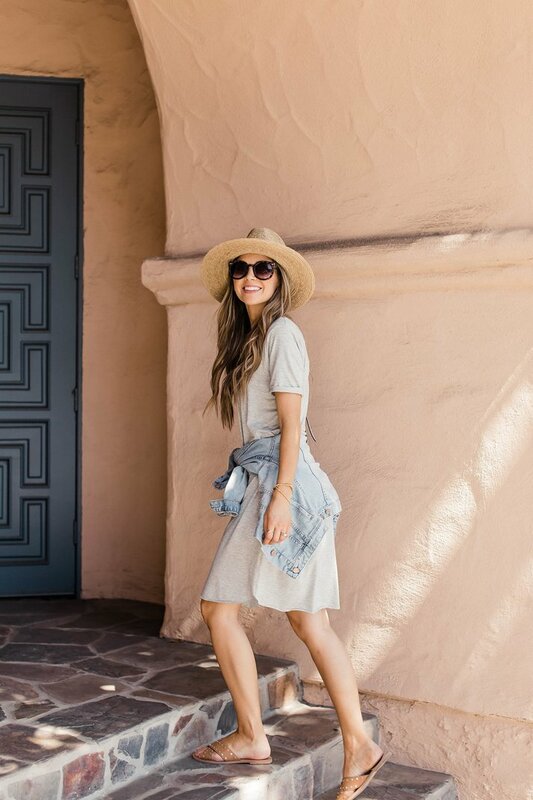 An easy t-shirt dress is one of my favorite simple dresses, and with a few accessories it makes the perfect casual outfit for traveling, running errands, or momming (I just made that word up, but it sounds good). Earlier this year, IndieSew sent me this gorgeous gray modal fabric, and I’m finally getting around to using it. It’s buttery soft, has a beautiful hand and drape, and is thick enough that it’s not at all see through. I made this easy little cuffed sleeve tee dress and I’m excited to share the tutorial so you can make one too! *NOTE: I do not provide patterns for my tutorials. I create all of my own patterns and share how to do it in this video! 1. First, cut your pattern pieces. You’ll need a DRESS FRONT and DRESS BACK, both cut on te fold. You’ll also need two SLEEVES, and two NECKLINE LINING pieces. 2. Take the FRONT and BACK pieces and, with right sides together, sew them together at the shoulders. 3. Now attach the sleeves. Line up the top of the SLEEVE with the shoulder seam of the dress (right sides together), and then pin them together, Then sew a straight stitch along the sleeve, attaching it to the dress. Repeat for the second sleeve. 4. Once both sleeves are attached, sew the FRONT and BACK (right sides together) together from the end of the sleeve to the bottom of the dress. 5. 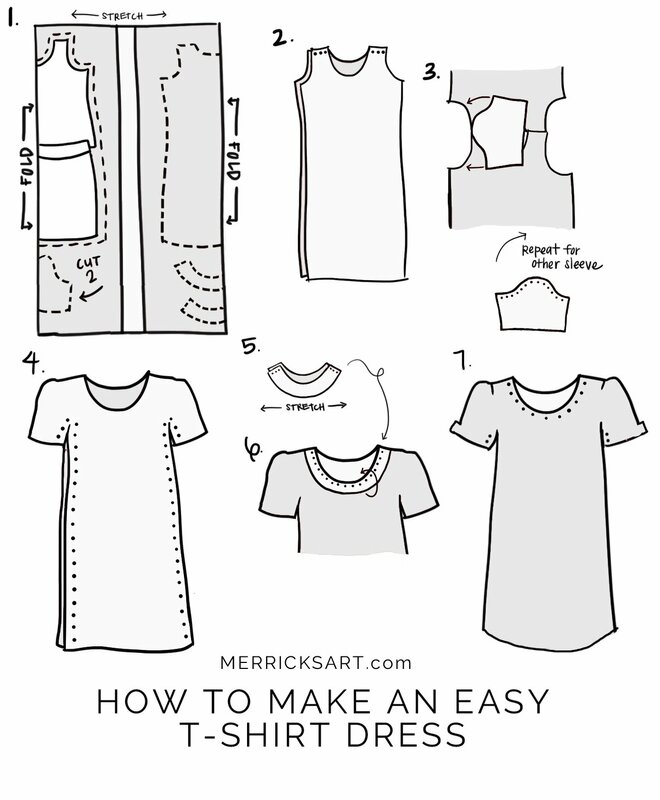 Take your two NECKLINE LINING pieces and, with right sides together, sew them together at the ends. They should now form a circle. Make sure this circle is several inches smaller than the dress neckline. It should need to be stretched to be attached (this will make your neckline flat and not wavy). 6. Place the NECKLINE LINING on the dress with right sides together, matching up the side seams of the LINING with the shoulder seams of the dress. Then streeeetch the LINING and pin it in place evenly along the dress neckline. Sew around the entire neckline with a straight stitch. Then trim the seam allowance and tuck the LINING inside the dress and iron in place. 7. Sew with a straight wide stitch around the entire neckline, securing the lining in place. Then try on the dress and determine your desired sleeve and dress length. Since knit doesn’t fray, and this knit just slightly rolls at the edge, I just cut the length instead of hemming. For the sleeves, just fold them up twice, then tack the fold on the inside by the armpit. And that’s it, you’re done! 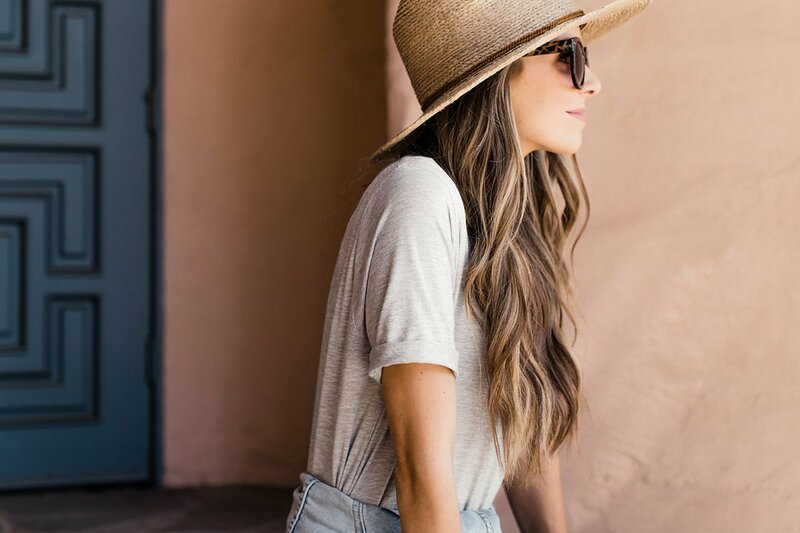 You are looking so cute in this laid-back and casual perfection of an outfit! I’m not sure how good I would be at this, but it would be really fun to try making this dress! I’ve always loved t-shirt dresses, they’re so comfortable but still make for a really cute outfit. I can’t believe you just made that dress! You are so talented, thanks for sharing the tutorial. (Even though I’m not sure I would be able to pull this off). Do you have a basic pattern you go off of or do you seriously just draw your dress on your fabric? Teach me!! Lovely dress! You are looking so cute. I can’t wait to try this dress. Thanks a lot for sharing. Hello, Do you have a video tutorial making rhis dress? I am having a hard time understanding Step 3. I see your picture of the sleeves but for some reason i cant grasp how inam supposed to attach the sleeve. I learn by seeing it done correctly and the picture/written directions are confusing me. I tried to make it and of course, my Sleeves are messed up. Its such a cute dress and i really want to make it. Thanks!